Blue indicates the traditional distribution area of Western Upper German (=Alemannic) dialects. Alemannic, or rarely Alemmanish (German: Alemannisch (help·info)), is a group of dialects of the Upper German branch of the Germanic language family. The name derives from the ancient Germanic alliance of tribes known as the Alemanni ("all men"). United States: Allen and Adams County, Indiana by the Amish there and also in their daughter settlements in Indiana and other U.S. states. Linguists dispute whether Alemannic varities are dialects of German or languages in their own right. 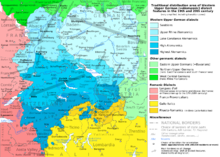 Alemannic comprises a dialect continuum, from the Highest Alemannic spoken in the mountainous south to Swabian in the relatively flat north, with more of the characteristics of standard German the farther north one goes. In Germany and other European countries, the abstand and ausbau language framework is used to decide what is a language and what a dialect. According to this framework Alemannic forms of German form a dialect continuum and are clearly dialects. Some linguists and organisations that differentiate between languages and dialects primarily on the grounds of mutual intelligibility, such as SIL International and UNESCO, describe Alemannic as one of several independent languages. ISO 639-3 distinguishes four languages: gsw (Swiss German), swg (Swabian German), wae (Walser German) and gct (Alemán Coloniero, spoken since 1843 in Venezuela). Standard German is used in writing, and orally in formal contexts, throughout the Alemannic-speaking regions (with the exception of Alsace, where French or the Alsatian dialect of Alemannic is used). Swabian (mostly in Swabia, in Germany). Unlike most other Alemannic dialects, it does not retain the Middle High German monophthongs û, î but shifts them to [ou], [ei] (as opposed to Standard German [aʊ], [aɪ]). For this reason, "Swabian" is sometimes used in opposition to "Alemannic". The Alemannic dialects of Switzerland are often called Swiss German or Schwiizerdütsch. Due to the importance of the Carolingian abbeys of St. Gall and Reichenau Island, a considerable part of the Old High German corpus has Alemannic traits. Alemannic Middle High German is less prominent, in spite of the Codex Manesse compiled by Johannes Hadlaub of Zürich. The rise of the Old Swiss Confederacy from the fourteenth century leads to the creation of Alemannic Swiss chronicles. Huldrych Zwingli's bible translation of the 1520s (the 1531 Froschauer Bible) was in an Alemannic variant of Early Modern High German. From the seventeenth century, written Alemannic was displaced by Standard German, which emerged from sixteenth century Early Modern High German, in particular in the wake of Martin Luther's bible translation of the 1520s. The 1665 revision of the Froschauer Bible removed the Alemannic elements, approaching the language used by Luther. For this reason, no binding orthographical standard for writing modern Alemannic emerged, and orthographies in use usually compromise between a precise phonological notation, and proximity to the familiar Standard German orthography (in particular for loanwords). Johann Peter Hebel published his Allemannische Gedichte in 1803. Swiss authors often consciously employ Helvetisms within Standard German, notably Jeremias Gotthelf in his novels set in the Emmental, and more recently Tim Krohn in his Quatemberkinder. The diminutive is used frequently in all Alemannic dialects. Northern and eastern dialects use the suffix -le; southern dialects use the suffix -li (Standard German suffix -lein or -chen). Depending on dialect, thus, 'little house' could be Heisle, Hüüsle, Hüüsli or Hiisli (Standard German Häuslein or Häuschen). A significant difference between the high and low variants is the pronunciation of ch after the front vowels (i, e, ä, ö and ü) and consonants. In Standard German and the lower variants, this is a palatal [ç] (the Ich-Laut), whereas in the higher variants, a uvular or velar [χ] or [x] (the Ach-Laut) is used. ^ Hammarström, Harald; Forkel, Robert; Haspelmath, Martin, eds. (2017). "Alemannic". Glottolog 3.0. Jena, Germany: Max Planck Institute for the Science of Human History. ^ "Swiss German / Alemannic / Alsatian". IANA language subtag registry. 8 March 2006. Retrieved 11 January 2019. ^ Jordioechsler (5 November 2013). "Alemannic German and other features of language". Wordpress. Archived from the original on 10 Jun 2017. ^ Jacobs, Stefan. "Althochdeutsch (700 – 1050)". stefanjacob.de. Retrieved 17 Oct 2017.